One of the more remarkable and underreported stories of this season has been Tampa Bay’s continued competitiveness despite the loss of the NHL’s most dangerous sniper. 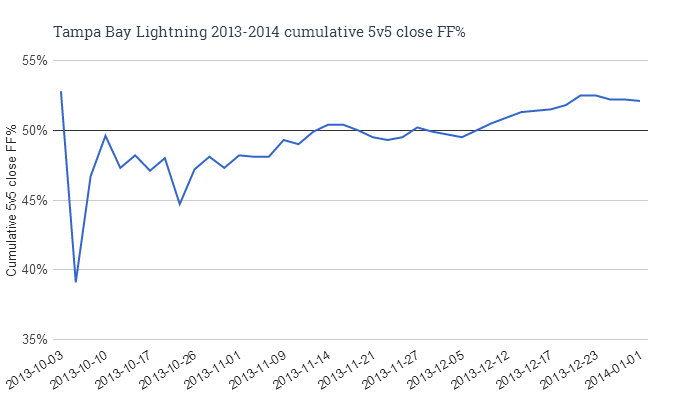 You could hear the wind whoosh out of Lightning fans’ sails when Stamkos went down in November, and for good reason. Martin St. Louis’s Art Ross Trophy aside, Stamkos was the driving force behind the Tampa Bay attack. Yet, at the time of this post, the Lightning are 3rd in the Eastern Conference, and 7-2-1 in their last 10 games. What changed when Stamkos went down? How has Tampa Bay managed to continue competing at such a high level? The short answer: they transformed from a star-driven team to a top-to-bottom threat. It was extraordinary, it was a model of what good management can accomplish, and it can be a lesson to teams in the future. After the jump, I’ll break down how it happened. It’s hard to overstate just how important Steven Stamkos was to the Lightning attack. Dating back to 2010-11, he had taken over 30% of all the Lightning’s shots at even-strength, a figure that puts him among the highest in the league. Largely through Stamkos and St. Louis’s offense, the Lightning were able to defy their middling possession figures during this period in time to record a points percentage just a hair under 60% (don’t forget, they were also fighting some terrible goaltending). 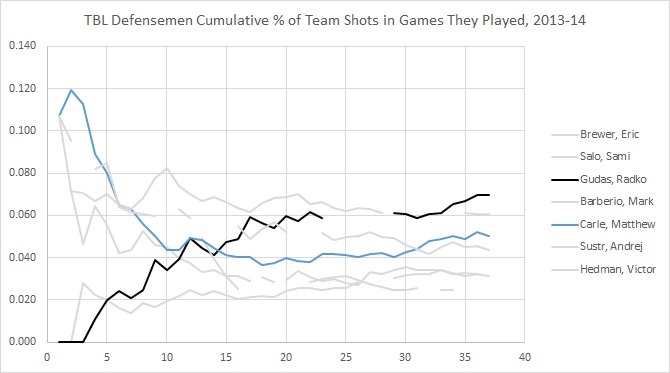 The chart above expresses player’s even-strength shot totals as a percentage of the even-strength shots taken by the Lightning in games this year. 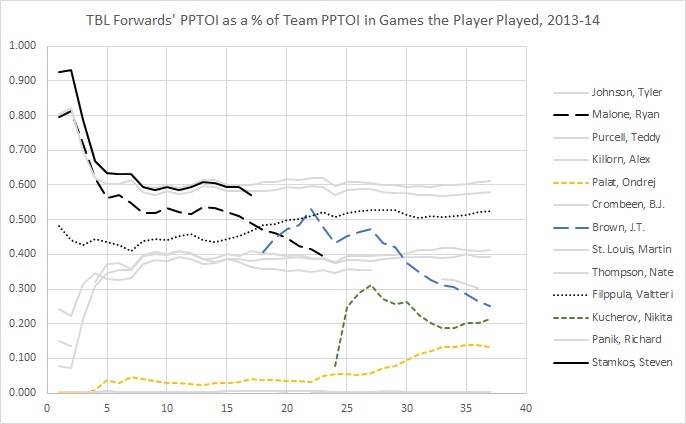 I highlighted the players that experienced significant change. For point-of-reference, Stamkos was injured in the 17th game. 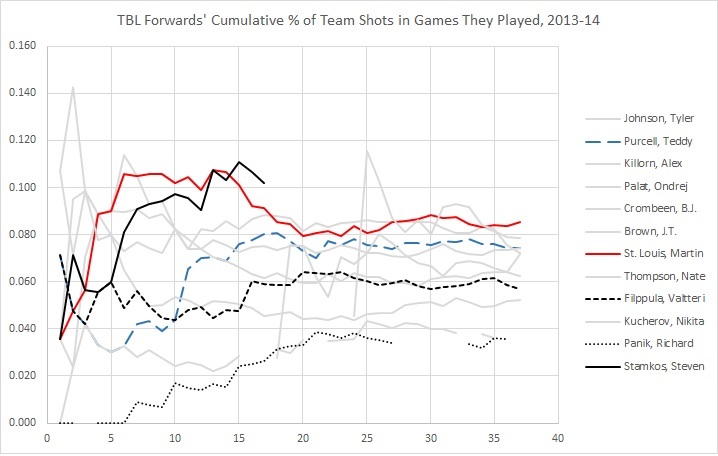 The first line that jumped out at me was the decline in Martin St. Louis’s contribution. Keep this in mind for an ensuing graph. Hello, Radko Gudas. There were whispers of Gudas’s potential role in the powerplay (in addition to the physical element he adds), and it definitely appears that he’s earned a larger role in the team’s offense. Carle has also seen a slight increase. Having seen these shot figures, I also wanted to see how Tampa Bay replaced the ice time, particular at even-strength and on the powerplay. 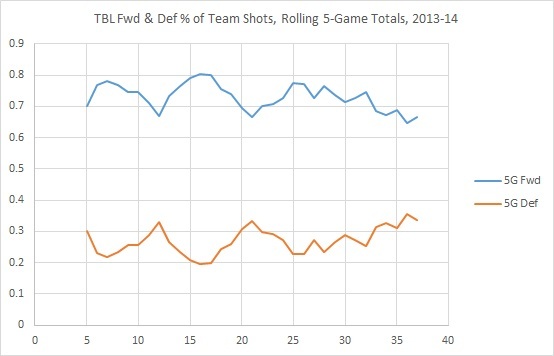 Stamkos took a large amount of the team’s ice time in both situations, so it’s worth seeing how they replaced it. 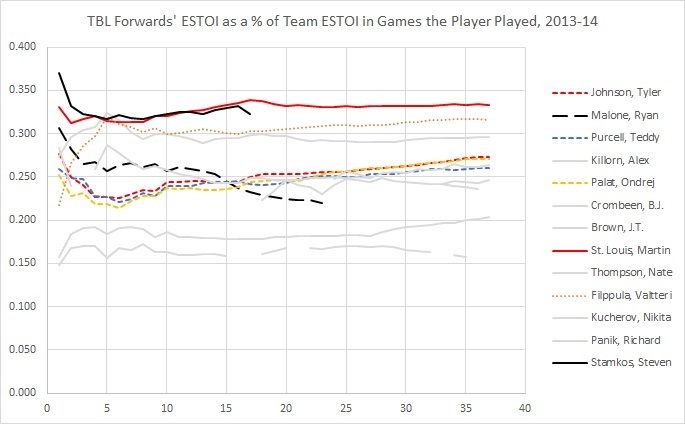 That’s possession tipping from below 50% to above 50% after Stamkos is injured. Meaning, with this lineup, the Lightning are playing a better possession game, the kind that is likely to bring them a winning record – something they couldn’t necessarily say before the injury. Same exercise as with the even-strength time, and we can see here that Filppula and Palat have both earned increased powerplay time with their play. And really, it’s hard to argue with that. Both Brown and Kucherov make an appearance, though they seem to be relegated to second-unit minutes, if any. Underpinning all of this is a strong performance from Ben Bishop, a goaltender who figured his game out in 2010-11, bounced around a bit, but has never looked back. It’ll be unrealistic to project him to continue stopping pucks at a 93.5% pace, but he’s good enough to stop them at a slightly above-average pace from here on out. All in all, what the Lightning did here was an incredible display of asset management, analysis, and execution (I should be wearing a suit when I’m saying this, I am aware). They transformed a team that was driven by Steven Stamkos’s offense into a team that has better command of the possession game. The results have been positive, though you can probably expect a slight regression from Bishop’s save percentage; whatever the case, they should still be able to stick in the playoff hunt. That said, Yzerman & Co. have found a way to weather a very difficult storm, and I think it will be very interesting to see what happens when Stamkos returns.